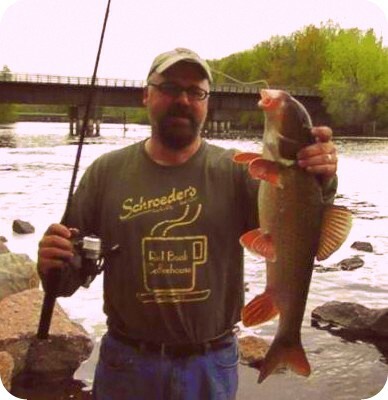 My Dad and I went down to one of the spots on the Wolf River, next to the Shawano Dam, where we have always had good luck with panfish and bass. This day the suckers were in and spawning, and foiled our plans for bluegills. We decided to have some fun with the suckers anyway. We kept three for pickling. They were each filled with roe, which I like sauteed in oil & butter, with onions and bacon, for breakfast. This batch of roe, however, I brined and pickled with what was left of the pickling juice I used for the fillets (they'll cook up much the same, but with a different flavor). The recipe for pickled suckers is simple, and is basically the same recipe I use for any number of fish species, such as small northerns or bullheads. I don't pickle a lot of fish, because I much prefer my fish pan fried, baked, or broiled in foil over a campfire, but it is nice to have a few jars of pickled fish around for when the mood hits or when we just want a quick snack to go with a cold beer on a summer evening. After cutting your fillets into chunks a couple inches wide let them soak in a brine solution of water and kosher salt (I use around 1/4 cup of salt for 4-5 cups water, but I admit I'm not real fastidious about measuring...it's more of an eye-balling and taste thing...). Let the fillet chunks soak for 1 to 3 days. I let these soak for only one day. Some folks say let your fish soak in the brine for 5 days, but I've never done that. After they're finished brining, rinse them THOROUGHLY in cold running water for several minutes. Let them sit in cold water for several more minutes and then rinse them again. They should be pretty well saturated with the salt brine, which hardens them up quite a bit, but you don't want them to taste too salty, so a good, extended rinsing is in order. While you're rinsing the fish boil the vinegar, wine, spice, peppers and brown sugar for a few minutes until everything dissolves (keep stirring it as it boils). Pack some sterilized canning jars with the fish chunks and onions, and pour the pickling brine over the top. Use a butter knife at the inside of the jar to allow pickling brine and spices to flow into the entire jar and remove some of the air pockets. Wipe the rims, put the lids on and screw on the bands. Date the lids and set the jars in your fridge for a few days to let the fish and pickling brine get better acquainted. For this particular batch of roe I made a less salty brine and soaked the eggs in that for a few minutes, packed them into a jar along with a few sliced onion halves and then added the pickling juice (strained to remove the spices) to fill. These won't last long as I'll probably have them for breakfast over the coming week, mixed in with omelets or scrambled eggs. For anyone wondering, sucker roe is much more mild than the salmon roe I cured a couple months ago. It has a very subtle, gentle flavor. Dad with a couple of large suckers.